I love, love, love having the chance to write about fantastic Christian movies, particularly when I get to give a copy away. 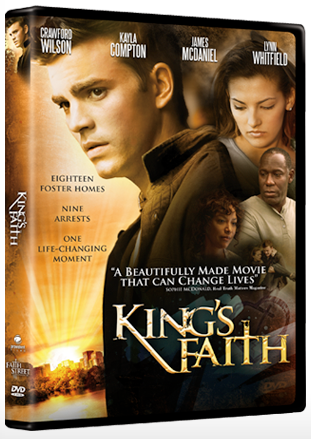 First note: King's Faith is rated PG-13. We ended up all watching it, and everyone from the 7 year old on up to Mom & Dad gave it two thumbs up. For the record, though, I doubt I would have been comfortable with my oldest guys watching this when they were seven. I think. Now that I've got that out of the way, I just have to tell you that this movie is fabulous and thought-provoking, and was great for starting some interesting discussions with my teens (and almost-teen) especially. As the city-bred teen enrolls at a suburban high school, he finds support from a group of believers. Yet the bonds of his old way of life—and the gang that wants to know where he hid their stash on a long-ago night—are strong. In his darkest moment, Brendan found faith. Now he must decide if it’s worth the price to hold on to it. Like I said above, everyone gave this movie two thumbs-up. There were some not-so-pleasant parts of the movie, and it doesn't give away a whole lot to spell out some of the things that might be objectionable for younger viewers. There is some violence, and the results of the violence (badly beaten kid, for instance). There is some stuff about drugs, but nothing "cool" or glamorous about it. Abortion is discussed briefly. The preview actually gives a pretty good idea as to the "why" for the PG-13 rating. Brendan is really an appealing character, as are his 18th set of foster parents. The kids Brendan gets involved with at school are great, though maybe portrayed a bit too "Christian-geek." My teens thought the best part of the movie was that good Christian people make the wrong choices at times, and becoming a Christian isn't portrayed as making it so you suddenly always do the correct thing and are always sure of where God is leading you. My husband thought one of the best parts of the movie was that the conflict we were watching wasn't about Brendan becoming a Christian, it was about him living as one. I loved that the characters were pretty much all at different places -- new to faith, solid in their faith, disillusioned about their faith, and more. Very few characters are one-dimensional (a couple of the minor ones are) and even when you are wanting to scream at them to make a different decision, you can look on and understand why they are where they are. Great, great movie. Especially for teens. If your kids are younger, you probably want to watch it yourself and decide if they can view it or not. And I have one to give away! US or Canada only, please! We'd be watching it as a family. I think I would watch it first to see if I thought my girls were ready. One of my daughters is very soft hearted, so I'm thinking she will not watch it for a long time. I would be watching this movie with my family. My daughter and I would watch it. I'd watch with my daughter! Sounds good! I'd watch it with my girls...probably not enough action and explosions for the guys. LOL! I'd watch this movie with my husband and our children. We love faith based movies! I would watch it with my hubby. Our kids are too young right now. I would watch this movie with my husband and 6 kids. I would watch it with my husband and daughter. Thank you for the chance to win it. I would watch this movie with my husband! I'd watch it with my two big kids. It's hard to get Lauren to stay still for a full length movie, especially if its not animated.